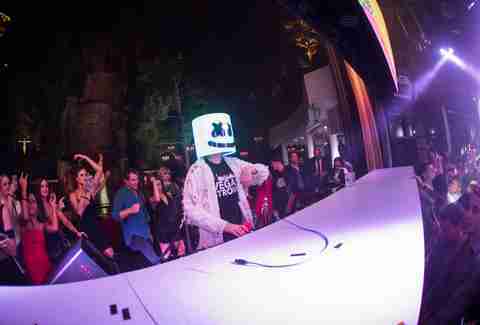 New Year's Eve is a big effin' deal in Las Vegas. And if you don't mind massive crowds, freezing temperatures, and a spike in Uber surge pricing, the Strip has you covered. 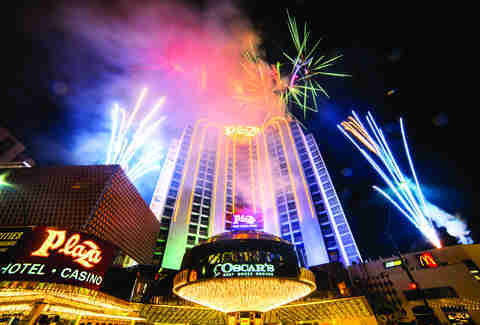 Fireworks will shoot off from seven casinos at the stroke of midnight while Las Vegas Boulevard spends the night closed to traffic between Sahara and Russell. It's one of those things you gotta check out at least once in your life, but keep in mind that there's lots of ways to stay busy throughout the entire city on New Year's Eve. Get familiar with the best parties around town as we eagerly say goodbye to 2017 -- a year we all want to forget as soon as possible. 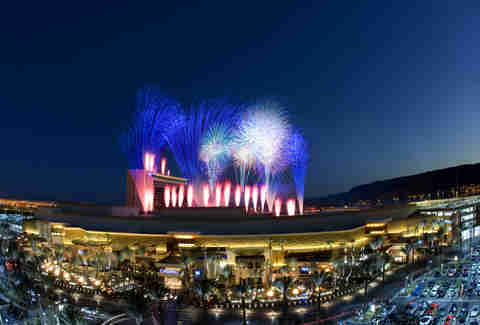 Instead of freezing on the ground, find an elevator to get the best view possible of the Strip fireworks. The most jaw-dropping vantage point of all is at the top of the Delano resort -- on the 64th floor to be exact -- with outdoor patio seating and floor-to-ceiling windows to check out the entire Strip from the south end. Skyfall cocktail lounge is hosting a 1920s-themed party with general admission starting at $195 per person. Neighboring restaurant Rivea has early dinners starting at $125 per person for a four-course prix fixe menu and escalating to $30,000 for a private dining experience for 30 people. (If that's not high-roller enough for you, how does $72,018 for 12 people sound?) In addition to the dinner, wine pairings, private dining room, and panoramic views of the fireworks, the package -- dubbed "A Private Firework of Aromas at Rivea" -- includes tastings of Midnight Louis XVIII and gift giveaways. A private DJ and photographer are thrown in as well -- so you can capture each moment without worrying about taking selfies all night long. Otherwise, you can hear some of the year's biggest pop hits with The Chainsmokers at XS nightclub or check out a big party at the Eastside Lounge where $100 includes table or sofa reservations, DJ, dessert bites, party favors, and a midnight Champagne toast. Pretty much every big restaurant at the resort will have a holiday menu, but you may want to go with the Country Club, which is marking its last New Year's Eve before closing in January. The $275 five-course menu is probably the only one in Vegas serving a Snake River Farms strip loin wrapped in foie gras and mushrooms on New Year's Eve. 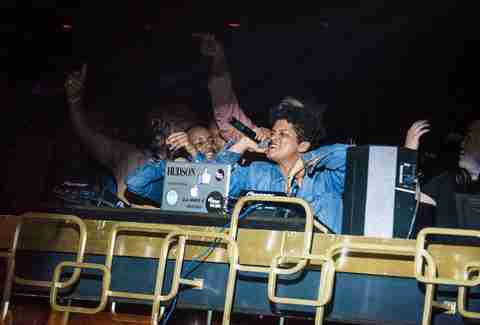 If pop music is your thing, tickets start at $100 to ring in the new year with Bruno Mars at Bank Nightclub. The "Glitz & Glamour" event will be hosted by the singer with an open bar 9pm-midnight. If you prefer a party in the same casino that's closer to the fireworks, Hyde Bellagio has an outdoor patio that overlooks those famous fountains and provides stellar views of the Planet Hollywood fireworks across the street. You can also get the same view from the balcony of Yellowtail -- Akira Back's Japanese restaurant -- which is serving its best-known dishes in a six-course family-style meal for $125 per person. Save a few bucks if you arrive early (between 5 and 6:30pm) when the same dinner is only $95 per person. New Year's Eve is the perfect opportunity for dining at one of the best new restaurants of 2017 -- while keeping your distance from the chaos of the Strip. Head to the southwest valley where The Black Sheep is serving up a three-course meal for $59 between 5 and 10pm. The main course is a choice between seared diver scallops, grilled marinated quail, Creekstone Farms rib-eye, or Vietnamese steamed rice rolls. Add on a wine or cocktail pairing for $30 (or a reserve wine pairing for $50). Sparrow + Wolf in Chinatown is hosting an "Innocence Lost" party at 10pm that's based on a Great Gatsby theme with "swanky dress" encouraged. The $125 ticket price includes food and drink -- like caviar bumps and a Champagne tower that's on the swanky side itself. Downtown will be even more packed than usual -- but the more the merrier when you're ringing in the new year. The Fremont Street Experience will host 12 bands playing on four stages -- with tickets starting at $35 in advance. If you prefer the warmth of being indoors, Oscar's Steakhouse at the Plaza is hosting a free party in the lounge with a DJ and shareable appetizers available until 1am. At midnight you'll enjoy a free champagne toast as well as the fireworks from the restaurant's famous circular dining room. There's also this terrific two-for-one deal: For a single $65 ticket, you'll enjoy a premium open bar (8-11pm) at both Inspire and the Gold Spike -- even though both venues are about two blocks apart. It's part of the Escape Masquerade celebration, so pick out the perfect costume and do a shot every time you see Harley Quinn. 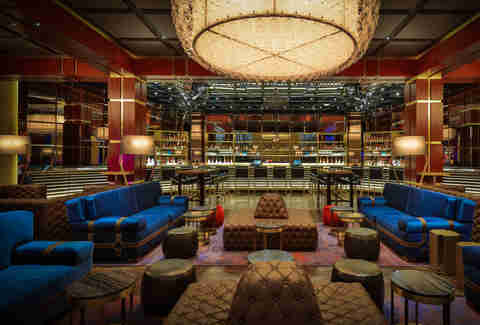 Thanks to an inventive menu by mixologist Sam Ross, The Dorsey has proven to be the most compelling and stylish new bar of 2017 -- but New Year's Eve is about much more than cocktails. The Dorsey is offering table packages, starting at $500 that include a bottle of Dom Pérignon and passed appetizers. (Contact thedorsey@sands.com to check availability.) You're also not far from the front door -- so if you want to join the civilians out on the street at midnight, the choice is yours. Another sophisticated spot on property -- and one of the best-kept secrets in Vegas -- is Prestige on the 23rd floor of the Palazzo. Open seating comes with a $225 price tag, but the party goes from 10pm to 2am and includes an open bar, dessert bites, and a perfect view of the Treasure Island fireworks through massive windows that surround the lounge. Go big and book the entire VIP room for $4,500. All the nightclubs on the Strip will be packed with big-name DJs, but it's hard to beat Calvin Harris at OMNIA -- especially with an outdoor patio to check out the fireworks. The real question -- where to eat beforehand? 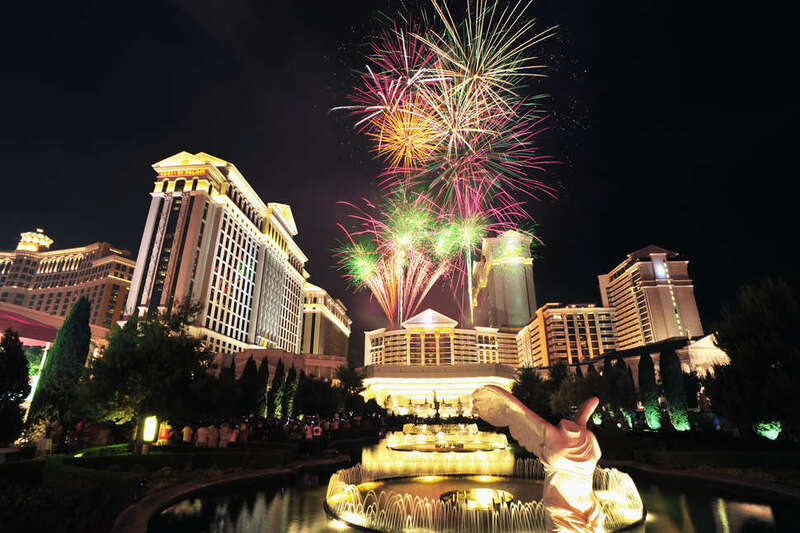 Scope out the rest of Caesars Palace for a dinner worthy of an epic New Year's Eve celebration. 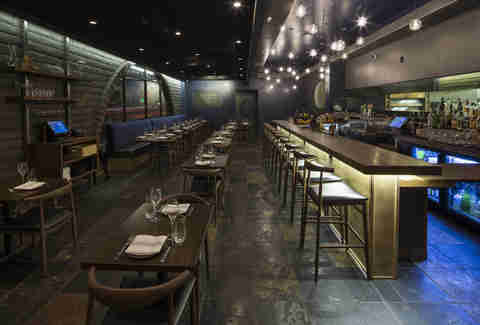 Searsucker has a $125 prix fixe menu (that drops to $95 between 5 and 6:30pm) while Old Homestead is preparing the ultimate surf n' turf dinner with a $225 meal featuring wagyu filet mignon and fresh Maine lobster. However, if you want to skip the club altogether, invest $600 per person in an awe-inspiring 14-course meal of French cuisine at Restaurant Guy Savoy -- which has its own quiet spot in the south end of the hotel and floor-to-ceiling windows for watching the NYE action outside. Wouldn't it feel good to hit a strike to kick off 2018? (Sounds oddly satisfying.) The Red Rock Lanes at the Red Rock Resort is hosting a New Year's Eve Cosmic Bowling party for $225 per lane with a limit of five people. The deal includes a large single topping pizza, a soft drink pitcher, door prizes, and party favors. Red Rock also has more traditional ways to celebrate. Hearthstone is offering a four-course prix fixe menu beginning at 4pm before switching into full party-mode at 9pm for an open bar, passed bites, music, and champagne toast for a flat $75. Sometimes New Year's Eve is better with a taco. For those in Henderson, Borracha at Green Valley Ranch has all-you-can-eat bar bites and an open tequila bar for just $60 -- starting at 4pm! However, if you prefer a Mexican restaurant with a front-row seat for watching NYE fireworks, Cabo Wabo is exactly what you need with all-you-can-drink deals. Its outdoor patio spills out onto the Strip while The Loft, an upstairs VIP area, is surrounded by giant windows to catch the holiday action from every angle. Still looking for the perfect view of the fireworks? Get your fix with a rooftop party. 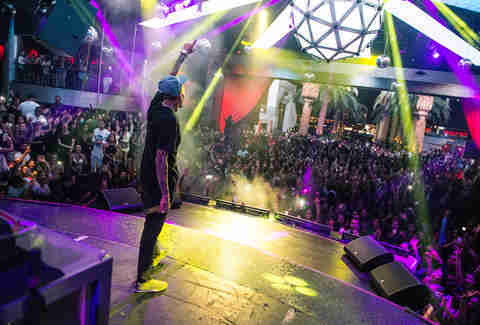 Chris Brown brings his own brand of dubious appeal to Drai's Nightclub, a gorgeous outdoor party spot 11 stories above the Strip at The Cromwell. 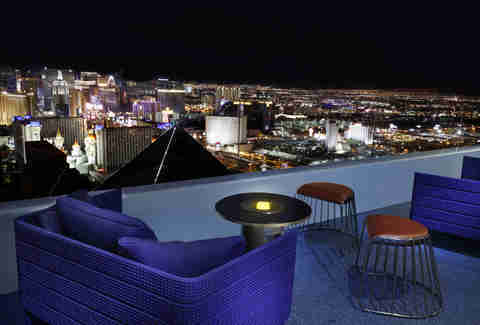 Meanwhile, Voodoo Rooftop Nightclub provides a 360-degree view of the entire valley from the 51st floor of the Rio. 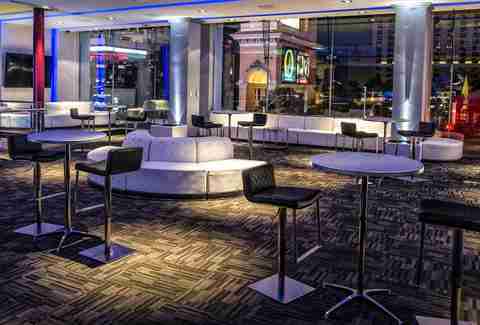 And did you even know that The LINQ Hotel has a rooftop event space? (Neither did we.) It's called The Vortex and it's hosting a party from 10:30pm to 1am with a DJ, go-go dancers, a late night DJ, and open bar. Even though New Year's Day falls on a Monday, there will be more than a few spots around town to help you recover after waking up -- whenever that may be. A good choice in the west valley is the annual pajama brunch at DW Bistro at the Gramercy. 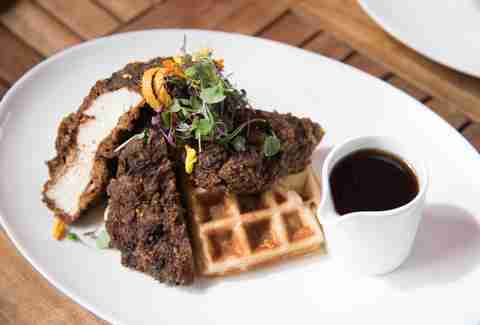 It begins at 10am, PJs are the fashion of choice, and yes, you want the jerk fried chicken and waffles. Border Grill at the Forum Shops has all-you-can-eat tacos for $20 per person and $20 margarita pitchers. And it's hard to pick just one Bloody Mary in Las Vegas, but you may want to give the brand new Canonita a try. Sitting on the Grand Canal at the Venetian, the casual dining spot will be serving a variety of Bloody Mary creations -- with a variety of garnishes -- all day long.